I am obsessed with healthy living and clean eating and live by the rule "something colorful for each meal". I am proud that my kids love broccoli and peas over most junk and they adore all fruit. Ask Dexter what his favorite fruits are and he will tell you granny smith apples, pomegranates and star fruit....oh yeah kiwi too". When it comes to fun foods, I am not a stick-in-the-mud. We all have our vices and corn dogs are definitely one of mine! I love a good corn dog and I would do almost anything to get a crispy, juicy corn dog just like the one you get at a fair! 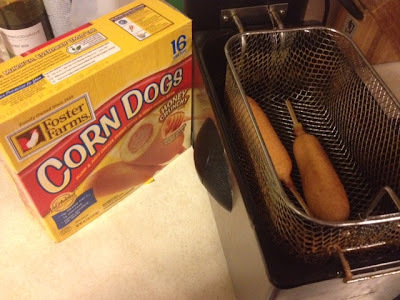 I have tried many a corn dog in my attempt to find the best but it wasn't until I tried Foster Farms corn dogs that I finally felt as though I had reached corn dog nirvana. The first meal we made with the Foster Farms Honey Corn Dogs involved our deep fryer with peanut oil as well as some homemade mashed potatoes and cauliflower. The kids loved their dinner that night and I loved knowing that their corn dogs didn't contain antibiotics or other harmful ingredients. After frying up the corn dogs I couldn't resist the first bite. The coating was subtly sweet and super crunchy and the middle remained juicy and perfect. I prefer to eat my corn dogs plain so I don't miss a thing! 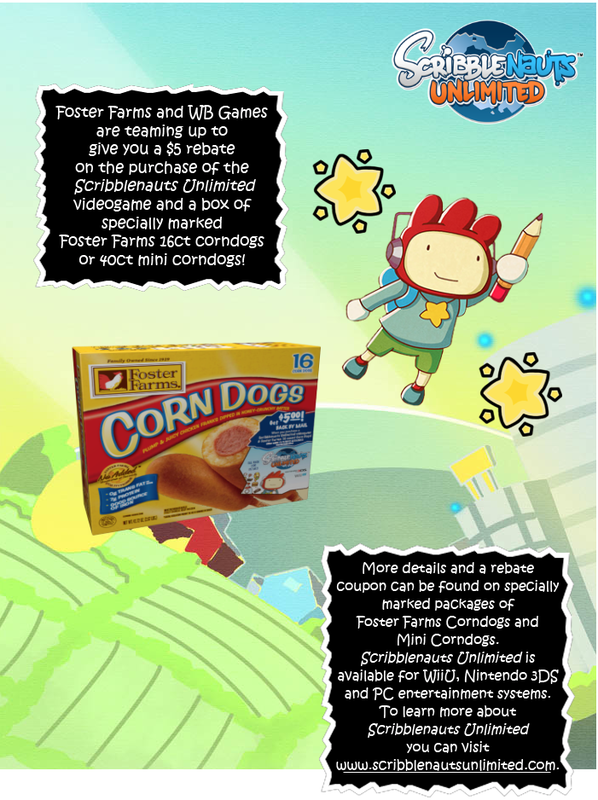 Oliver loves to make a mess and he also loves his "dog dog on stick"
For a limited time receive a $5 rebate when you purchase Scribblenauts Unlimited for Wii U, 3DS or PC AND a specially marked 16ct corndog or 40ct mini corn dog package from Foster Farms. More details can be found here. Want to win a box of corn dogs and a copy of Scribblenauts for Wii U courtesy of Foster Farms? Family-owned and operated, Foster Farms continues its legacy of excellence and commitment to quality established by its founders, Max and Verda Foster. Foster Farms Corn Dogs can be found in the following varieties: Honey Crunchy Corn Dogs, Mini Honey Crunchy Corn Dogs, Jumbo Honey Crunchy Corn Dogs, Chili Cheese Corn Dogs and Family Fun Pack. Foster Farms also produces a new Lower-Sodium, 100% Whole Grain Chicken Corn Dog for foodservice that was awarded the Parent Tested Parent Approved (PTPA) Winner’s Seal of Approval in 2012. Foster Farms offers delicious fresh, pre-marinated, ready-to-cook and fully cooked poultry products that meet the quality and convenience needs of today's home cooks, retailers, warehouse clubs and foodservice customers. Visit www.fosterfarms.com to learn more. I like my corndog dipped in mustard and ketchup. 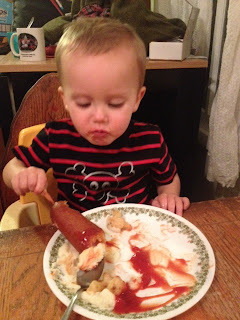 One of my corndog memories is the entire cornmeal coating falling off as I started to eat my corn dog! I'd like to eat mine by the ocean on a warm sunny day. I like mine with mustard and we always got them at the state fair when I was a kid. I like mine dipped in mustard. A favorite memory was going to fair with my family and eating a corndog. I like eating it plain! I like to it with some honey mustard. Thanks for the chance. I eat my corn dogs plain, no ketchup or mustard and I don't really have any particular memories other than always loving corn dogs. With mustard. My hubby did not like corn dogs. He tried one that I had bought and now he likes them.